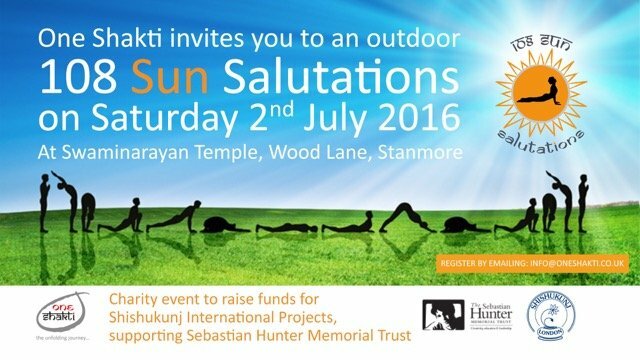 We are delighted to announce that One Shakti are going to be supporting us with their 108 Sun Salutations charity event this year. The Sun Salutation is a series of Yoga postures practised in a flowing sequence promoting physical, mental and spiritual health. In most yoga session only a few rounds are conducted. On this day the team of experienced One Shakti instructors will guide you gracefully through the postures and sequences. Having some experience of yoga and Sun Salutation practice will help but is not a pre-requisite – together we will accomplish the 108 sets. The event will be raising funds for a permanent school in the remote region of the Jawadi Hills, in a village called Thanimaruthur. It is going to be a wonderful day, we hope you can join us!